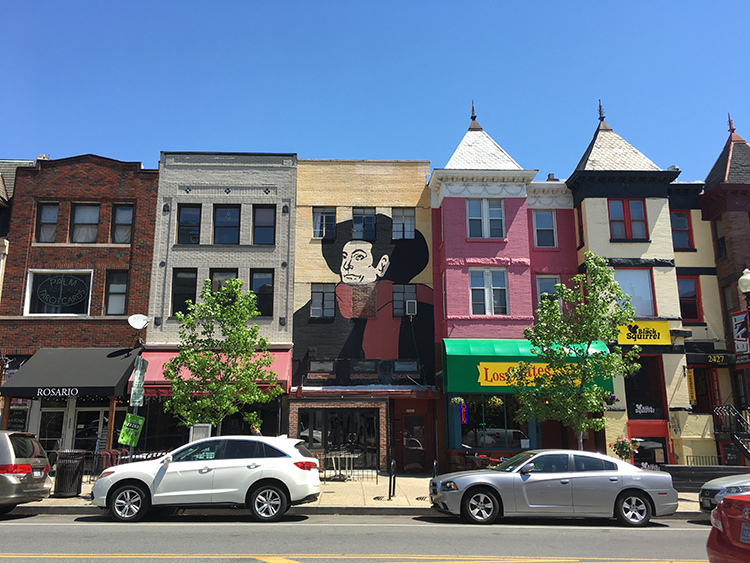 On the bustling sidewalks of 18th Street, NW, in DC’s Adams Morgan neighborhood, you might notice something familiar. A vibrant mural of one of Toulouse-Lautrec’s most famous posters of the singer Aristide Bruant has been residing in the area for over a decade. Starting off as Café Lautrec, the space is a 2,100 square foot storefront that was owned by André Neveux. The café’s name later changed to Café Toulouse. Neveux, who was the original owner of the space, painted the mural on the building. It has since closed, but the mural lives on. We here at the Phillips can’t help but chuckle at the parallels between the proximity of Toulouse-Lautrec works and Tryst café. This Toulouse-Lautrec inspired mural is just a few storefronts down from the original Tryst café, and our current Toulouse-Lautrec exhibition is just a couple of floors up from Tryst at the Phillips. Each week for the duration of the exhibition, we’ll focus on one work of art from Toulouse-Lautrec Illustrates the Belle Époque, on view Feb. 4 through April 30, 2017. Divan Japonais advertises the reopening of a café-concert located on the rue des Martyrs, renovated to be Japanese in theme. For this work, Toulouse-Lautrec adapted a Japanese aesthetic—flat cropped shapes, unusual vantage points, dark contours, and vibrant colors—featured in work like Kitagawa Utamaro’s The Nakadaya Teahouse. 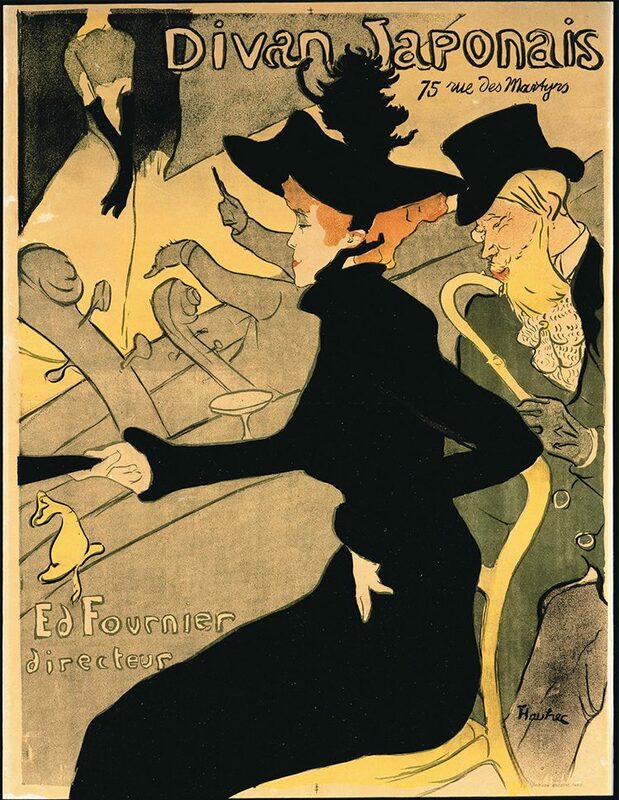 By the 1880s, Toulouse-Lautrec had seen ukiyo-e prints at Paris galleries and the Exposition Universelle. Like many of his contemporaries, Toulouse-Lautrec collected Japanese art and even ordered specialty supplies from Japan. Following the invention of the pneumatic tire in 1888, cycling became a fashionable, modern-day sport. Competitive cyclists raced at Vélodrome Buffalo and Vélodrome de la Seine on Sunday afternoons, with Toulouse-Lautrec in attendance. In 1896, Louis Bouglé, the French representative of the English Simpson cycling company, commissioned Cycle Michael, which advertises a bicycle chain. Bouglé also managed Welsh racing champion Jimmy Michael, shown here sucking a toothpick as he is timed by trainer “Choppy” Warburton. Bouglé rejected the poster design due to the inaccurate rendering of the chain product. Toulouse-Lautrec printed 200 impressions in olive-green for cycling fans. 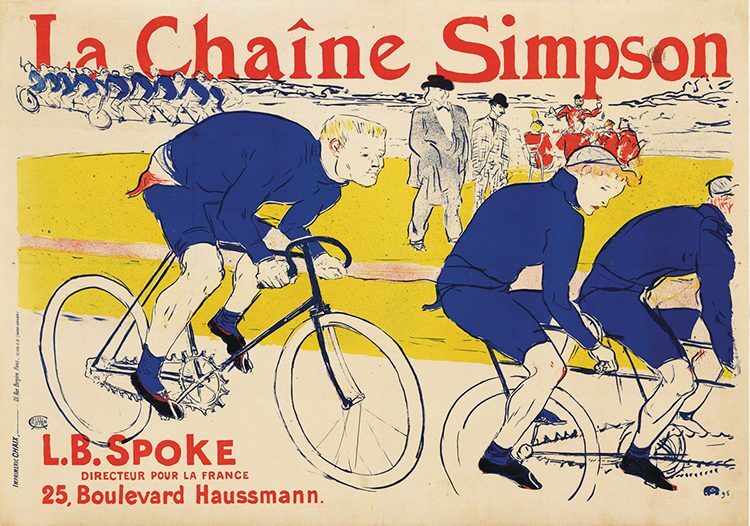 The Simpson Chain—Toulouse-Lautrec’s second attempt at the Simpson cycling company’s commission—was a success. For this work, he accurately depicted the chain and infused the scene with dozens of cyclists zipping around the track, their blurring wheels creating the effect of speed. French cyclist Constant Huret follows two pacing riders, the first partially cropped to reinforce movement. In the center of the ring stand Bouglé and company owner William Spears Simpson.